Michael Pisaro was born in Buffalo in 1961. 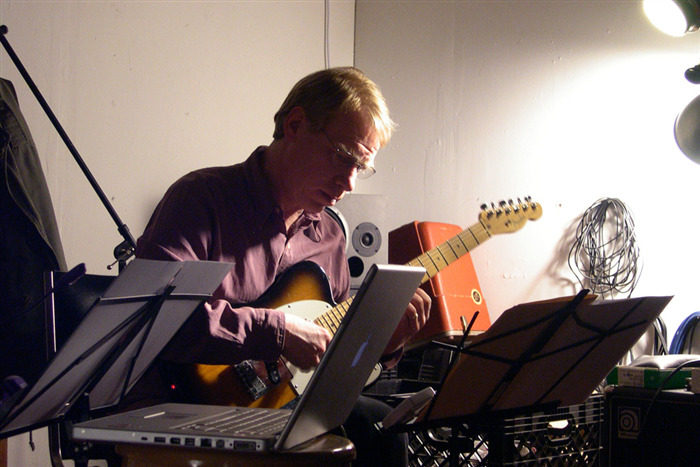 He is a composer and guitarist, and a member of the Wandelweiser Composers Ensemble. He has composed over 80 works for a great variety of instrumental combinations, including several pieces for variable instrumentation. A particularly large category of his works is solo works, notably a series of 36 pieces (grouped into 6 longer works) for the three-year, 156-concert series organized by Carlo Inderhees at the Zionskirche in Berlin-Mitte from 1997-1999. Another solo piece, pi (1-2594), was performed in installments by the composer on 15 selected days in February, 1999, in Evanston, Illinois, and in Düsseldorf in 2000-2001. His work is frequently performed in the U.S. and in Europe, in music festivals and in many smaller venues. It has been selected twice by the ISCM jury for performance at World Music Days festivals (Copenhagen,1996; Manchester, 1998) and has also been part of festivals in Hong Kong (ICMC, 1998), Vienna (Wien Modern,1997), Aspen (1991) and Chicago (New Music Chicago, 1990, 1991). He has had extended composer residencies in Germany (Künstlerhof Schreyahn), Switzerland (Forumclaque/Baden), Israel (Miskenot Sha'ananmim), Greece (EarTalk) and in the U.S. (Birch Creek Music Festival/ Wisconsin). Concert length portraits of his music have been given in Munich, Jerusalem, Los Angeles, Vienna, Brussels, Curitiba (Brazil), Berlin, Chicago, Düsseldorf, Zürich, Cologne, Aarau and elsewhere. He is on the composition faculty at CalArts. He also taught music composition and theory at Northwestern University from 1986 to 2000.